Druchii.net - View topic - v. Vampire Counts: They are dead, undead, undead! 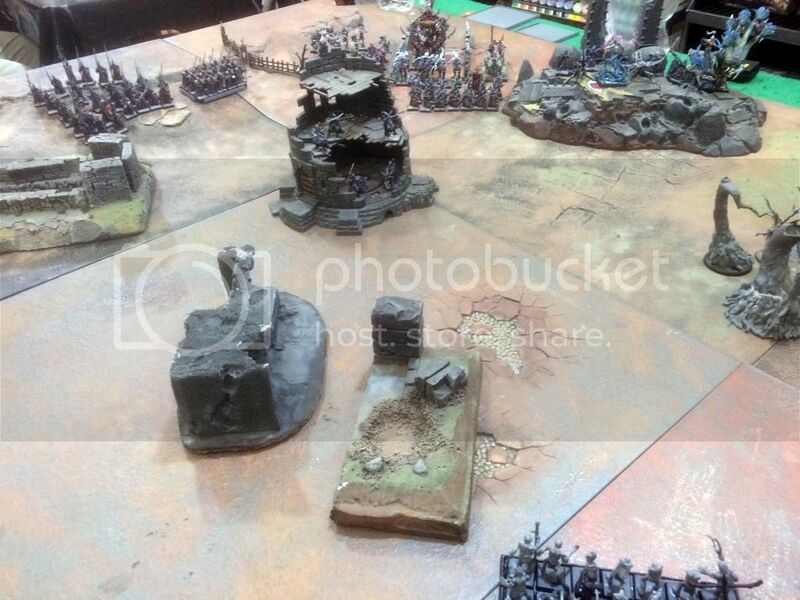 As you can see, my left flank is weak and exposed, most of my army is too far from the field of battle, and there's a Dreadstone Blight tower blocking my way! 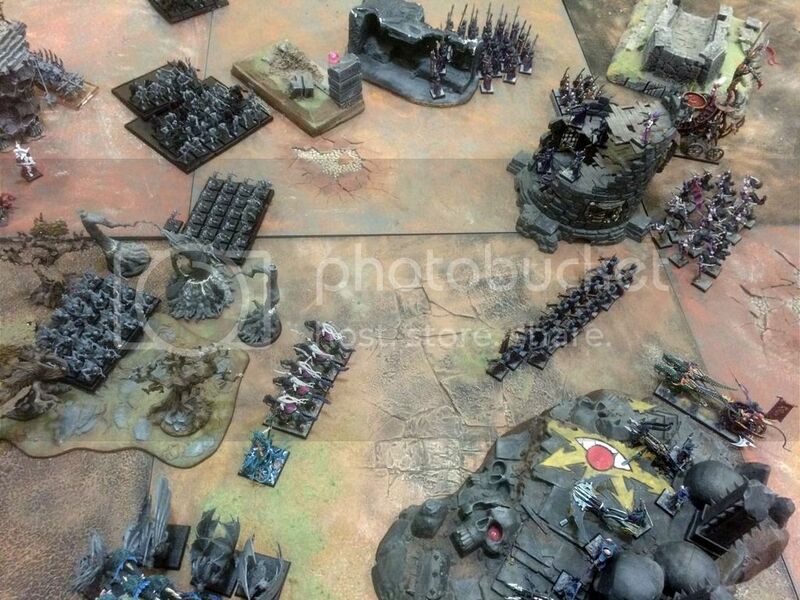 If the undead concentrate on that side, they can take out my army piece by piece, and that won't do. I have to re-form in front of that tower, and quickly. 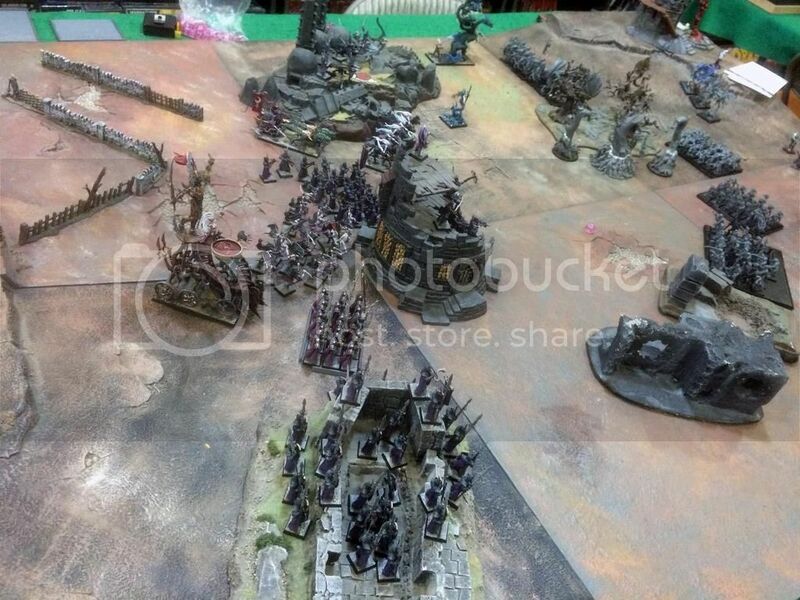 They have 5 Black Knights, 3 Vargheists, 40 Ghouls, 40 Skellingtons, 30 Zombies, a Corpse Cart, Vlad, Isabella, Krell, a nameless Wight King, a nameless Vampire Lady, and two Nick-romancers. I have Princess the Hydra, Aunt Maddie the Medusa, 3 Reaper Bo Throwers, 5 Bo 'locks, 20 Cross-bo's, 20 Keening Bo's (witch elves), 30 Bo Guard (dreadspears), 15 Head Chop Bo's (executioners), Dread Lady Boanne, Sorceress Aoifanne, and Death Hag Mhoireanne on her Cauldron of Blood. 5 Shades of Bo occupy the dreadstone blight. They just move forward in a straight line, ignoring my weak left flank except for sending the Black Knights and Vargheists in that direction. They try to charge the Reaper Bo Throwers on the Temple of Skulls, but they would both need a 12 and fail. The Ghouls move into the the edge of the forest. They summon up 3 ghost hosts and more zombies, merging with the original horde. The Reaper Bo's only hope is Princess, so I send her out to breathe fire on the Black Knights and charge them. The Bo 'locks and Aunt Maddie run to the left to try to cover that gap, but aren't quite there yet. Princess takes 3 wounds, but between her and the Reaper Bo Throwers they ALMOST wipe out the Black Knights -- leaving a single one with only one wound. Everyone else runs, and luckily I roll 5's and 6's. The Bo Guard run into the first ruins on the right. The Head Chop Bo's run to their left, the Keening Bo's run behind the tower, and the Cross-bo's run toward the still-exposed left flank. TURN 2: The remaining Black Knight gains aonther two friends. The Nick-romancer hiding behind the Deathknell Watch tower summons another 10 Black Knights. The vampire lady summons a wraith. They raise up another zombie horde behind the first. The Ghouls advance through the forest. The ghosts try to reach Princess: their own Black Knights are in the way, but Princess destroys them, so the ghosts are able to pile in, as are the Vargheists. Zombies and Skellingtons still advance toward my right flank. The Bo Guard run again, this time into the next ruin. The Head Chop Bo's cover the gap between them and the Tower. Aoifanne joins the Shades in the tower. The Cross-bo's form a line while still edging toward the left, but the Keening Bo's are blocked in the bottleneck. The Bo 'locks and Aunt Maddie move to guard the edge of the forest from the advancing ghouls. The Cross-bo's and Reaper Bo Throwers shoot everything at the Skellingtons, wiping them out! The Cross-bo's finally move into position on the left flank, allowing the Keening Bo's to move forward and guard their right, with the Shades and Aoifanne in the Dreadstone Blight on their right, then the Head Chop Bo's, and the Bo Guard in the Ruin. Just in time, as the undead are about to charge. The Ghouls in the forest decide not to charge, fearing losses from charging through a forest, and have the summoned Black Knights clear the way for them instead. 'Do it!' I say. 'You won't get another chance!' But I am not listened to. The Cross-bo's and Reaper Bo Throwers concentrate everything on the cowardly ghouls, leaving not a single one. 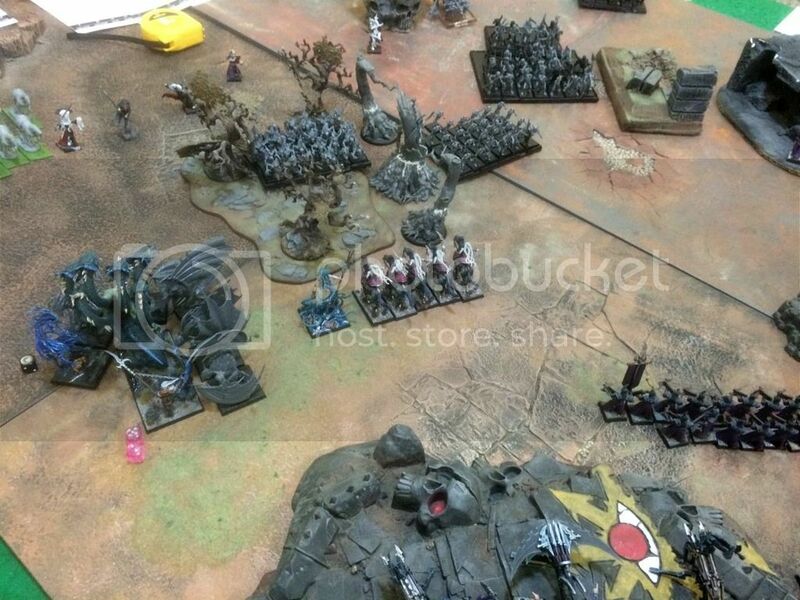 a) The big zombie horde charges the Head Chop Bo's, killing 6 and gaining one as a fresh zombie. There may be 48 of them, but they can't all reach the fighting! However, they've moved close enough for the Bo Guard in the ruin to pile in. When it's over, there will be only about 15 zombies left. b) Princess finished off the Vargheists, but is finally done in by ghosts. The summoned Black Knights charge the Bo 'locks and Aunt Maddie, doing little. The Bo 'locks unbind several more summonings. The Bo 'locks and Maddie fight on against the Black Knights. The last Ghost Host and Wraith try to get around them and reach the Reaper Bo Throwers. The Bo Guard and Head Chop Bo's finish off the last of the zombies. There is another zombie horde threatening their flank, but the Reaper Bo Throwers shoot it to pieces. 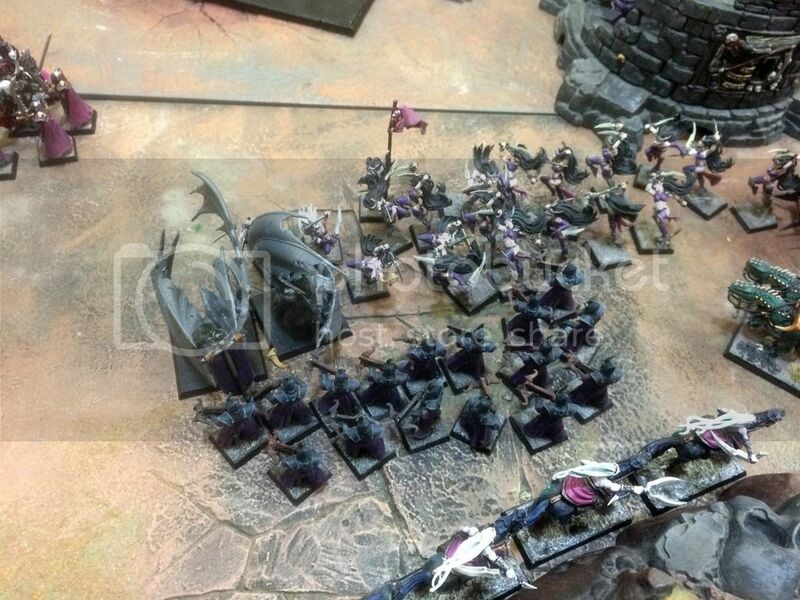 Unfortunately, they summon up another 5 Black Knights, another 10 Ghouls, and the 3 Vargheists again. Are you kidding me? How many times do I have to kill these guys! The newly-summoned Vargheists charge the Cross-bo's, killing 4, but the Keening Bo's pile in and kill them all... again. 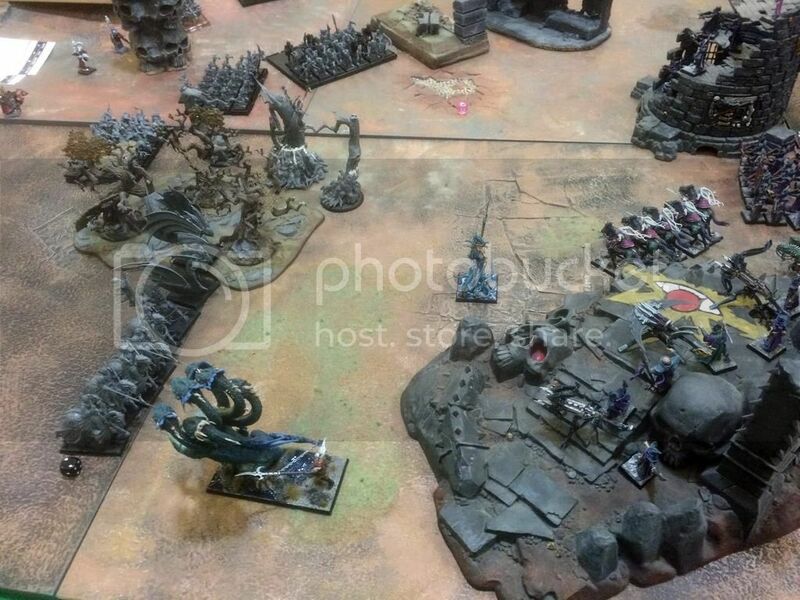 The Bo 'locks retreat from combat with the Black Knights, to get out of the way of the Reaper Bo Throwers line of sight. The Vampire Lady gets too close and gets shot to bits. Unfortunately, we fail to kill most of the Black Knights and Aunt Maddie still has to fight them off. She's hurt, but fights on. The Head Chop Bo's charge at Vlad, Isabella, and Krell. They chop Isabella's head off, but fail to hurt Vlad at all! It's still not quite a decisive victory, but the Undead have lost more than half their army (some of them twice! ), and we have only lost Princess (sob!) six Head Chop Bo's, and four Cross-bo's. The Undead give up and return to their smelly, damp castles! RESULT: Yep, a Bo Victory again! The hero of this battle was Princess. 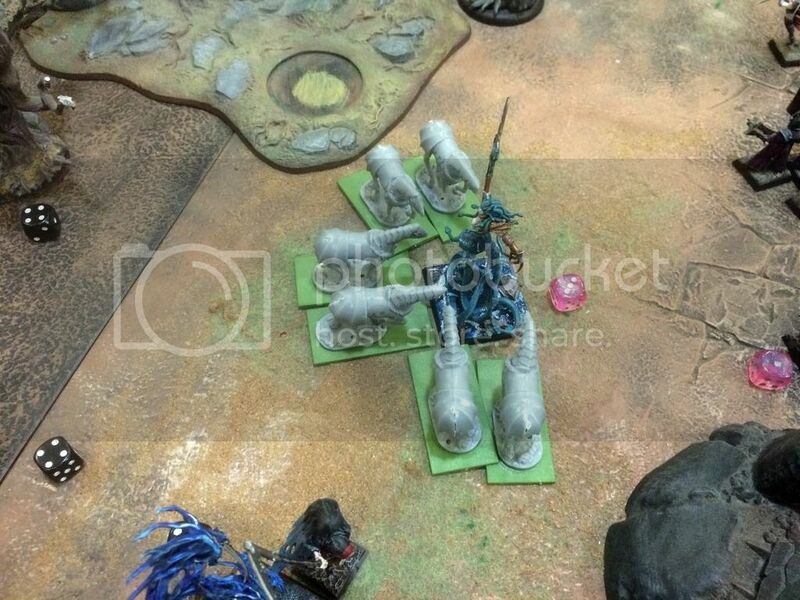 If she hadn't been there protecting my left side, Black Knights, Vargheists and Ghosts would have just overwhelmed the Reaper Bo's on the Temple of Skulls and then taken out my units one by one as Ghouls, Skellingtons and Zombies pressed from the front. Once again, my opponent became distracted with killing her instead of doing the sensible thing: holding her up with one unit and going around her with the rest. I don't know what it is about Princess, but my opponents just can't leave her be! With her protecting them, the centre of the battlefield was a killing field for the Reaper Bo's. Not charging through the forest with the Ghouls was also a mistake. I managed to recover from a very bad deployment thanks to luck and strategy. Luck, because I needed to cover a lot of distance on the right to get to where I needed to, and I rolled high on my runs when it counted! And strategy because I knew where my troops needed to be in order to face the undead advance. The only question was, would I get there in time? As it happens I did, but only because my opponent failed to take advantage of my exposed left flank. It just goes to show, contrary to what some people are saying, that deployment does matter and it is not just 'push everything forward and roll dice'. 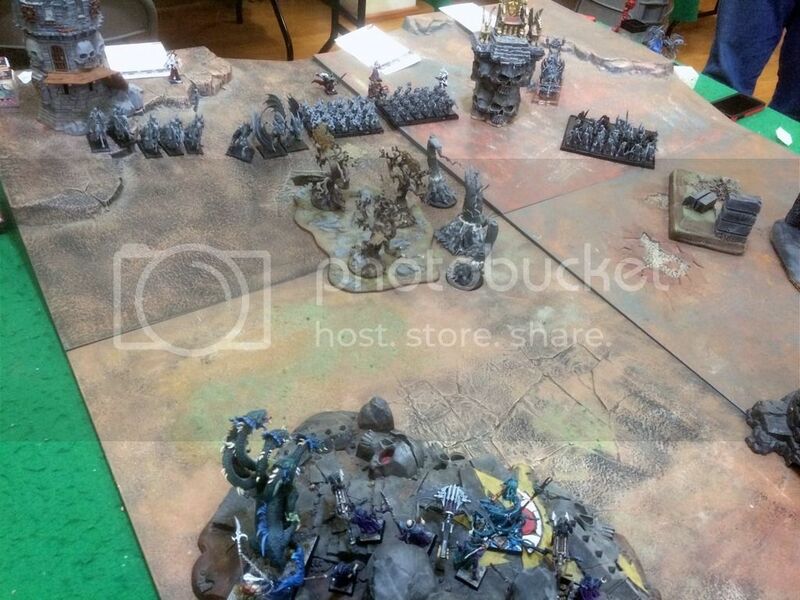 Sure, you can play it that way, but if you're playing against someone with an actual plan it will be a meat grinder... for you, even if you can re-summon your entire army again and again! 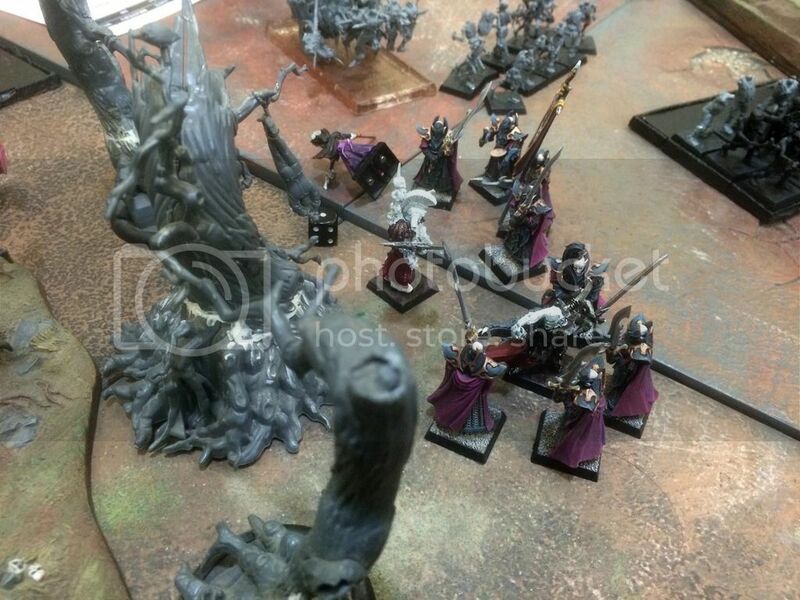 Re: v. Vampire Counts: They are dead, undead, undead!